“Because being born a human being gives you the ability to do so much for your karma (both good and bad) it is seen as a precious opportunity to help your fellow man and possibly even attain enlightenment. The story goes, imagine there is a turtle adrift at sea that only surfaces every 1000 years. Now imagine there is a small ring in this vast sea. It is more likely for the turtle to accidentally poke its head through that ring than to be born a human being. Honoring artisan Sampa Lhundup Tibetan Woodcarver who created the elegant wood carving of a turtle emerging from the ocean with a ring around its neck. 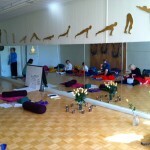 On March 9th, The Place at Center hosted the CNY branch of American Penwomen for a 4 hour yoga retreat. 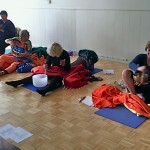 We began with a centering/meditation, followed by energization exercises and gentle stretching. We focused on gently opening the second chakra (energy center)– the seat of our creativity. We used color-orange blankets, some orange clothing, carnelian crystals. We practiced pranayama (breath control) to bring more vitality (prana) into our bodies. We chanted seed (bija) sounds to quiet the mind. We listened to water sounds to help creativity flow. We experienced brass and crystal singing bowls to take in their sounds –all to bring vibration to the cellular level. In the first photo, there is a bouquet of roses. Each participant was given a rose upon arrival and asked to put it in the bouquet in the middle of the tealight mandala as an intention. Upon completion of the retreat, each woman took a rose home as a remembrance of their intention. 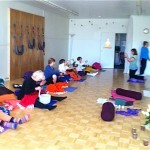 In this photo, we are practicing with singing bowls–brass and crystal. Everyone really enjoyed this. It was nice to receive thank you notes following the retreat telling us how poetry and art flowed from the Penwomen’s experience at The Place at Center. “Why should we leave our shoes at the door?” you ask. Removing shoes upon entering a home or sacred space is an ancient custom practiced throughout the world. It is customary in Asian and Scandinavian countries and in Hawaii to remove your shoes upon entering someone’s home. It keeps the dirt of the outside world out and makes movement within the house quieter. Think of all the places where your feet have been on your journey to that door and what they may have stepped on or for that matter, in! You may have walked across grass sprayed with pesticides, you may have stepped in motor oil that has leaked from cars. If you’ve visited a school, hospital or a doctor’s office, your soles will have picked up bugs from there. If you shopped in a grocery store, you may have picked up all of the above from all the feet that passed through the aisles prior to your being there. A garage where you’ve had your car repaired will leave chemicals on your footwear. Or if you have walked by a spot where an animal eliminated, well….. Removing shoes at the door is an act of cleanliness. But leaving your soles at the door is also a spiritual practice. It is a way of showing reverence for something greater than oneself. In Hebrew scriptures, Moses took his shoes off at God’s command. It is written: “Take off your sandals, for you are on holy ground.” Hindus, Buddhists and Muslims remove their shoes before entering a sacred space. For Hindus, shoes are considered impure. Cultured Hindus never wear shoes into their homes, friends’ homes or temples. Traditional Chinese Medicine believes going barefoot stimulates your reflexology points. Where we practice yoga, we remove our shoes. We cultivate mindfulness for the place we occupy, we “touch the earth” with our feet and we leave the world outside. Why Would I Want to See the World Upside Down? Going upside down or into an inverted yoga pose may take a bit of courage, BUT the rewards are enormous!!! “What’s in it for me,” you ask? Well, rejuvenation for one, revitalization for two–and a whole lot more! There are several inverted asanas (poses.) Some of the most popular are Vipiritikarani (legs up the wall,) Sarvangasana (shoulder stand,) Halasana (the plow) and sirsasana (headstand.) All have similar benefits, but the King of Asanas according to BKS Iyengar is SIRSASANA–headstand. In the photo at right, you see a supported inversion on the rope wall for those who would like to ease into the practice of headstand. Headstand has tremendous positive effects on the mind, body and spirit. The first thing it does is to reverse the effects of gravity that wear us down. Gravity keeps us from flying off the planet, but it also presses our blood and fluids away from our head and heart toward our feet and ankles. Do you find that your feet and ankles swell after a long plane ride or after sitting for some time in a car or at a desk? Gravity is doing that. Gravity also presses our flesh and organs downward. We are constantly working to stand up straight and strong and to move under a force that works against our anatomy. Headstand uses gravity to help. It increases the flow of blood to the brain. It stimulates the thyroid, parathyroid, pituitary, hypothalmus and pineal glands. This is important work as these glands interact with each other to regulate all systems of the human body. Headstand calms and revitalizes the mind. It alleviates stress, insomnia, depression. It regulates metabolism and relieves constipation. It improves circulation, digestion, memory and concentration. It is also a very inexpensive facial as blood flowing to the head rejuvenates and brings a natural glow to the skin. In short, headstand helps slow the aging process. Going upside side down could be a good thing. During yoga teacher training, I was going deeper and deeper in my meditations. I felt I needed a mentor to help me understand what I was experiencing. I asked my teacher for a recommendation for who I might go to for help. He said he would think about it. The next time, we were together he handed me a clipping from Yoga Journal of Amma and her tour schedule in the U.S. He had Boston circled. To say I was surprised was an understatement. I expected the name of a teacher who I might enroll in classes or private sessions for instruction. Imagine my further surprise to learn that Amma is an avatar, an incarnation of the divine. What was I supposed to do with this? 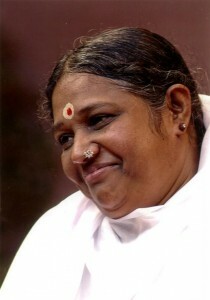 The Boston date coincided with my wedding anniversary, so the next best date for me acquaint myself with Amma was Friday, July 20, 2007 in Toronto, Canada. A friend and I drove six hours the day before in order to be there and fresh prior to morning darshan. We drove for much of the trip, in heavy rain in the dark. I never felt fatigued or frustrated which is amazing since we left after work and I do not care for driving in either of those conditions. After checking into the Sheraton Hotel where Amma would hold darshan and settling in for the night, I slept soundly. We had to rise early the next morning to reserve a place in line. Darshan (a blessing received from a divine being) was to begin at 10 am. By 8 am, the line was getting long and tokens for entrance weren’t to be given out until 9 am. My friend and I were standing in this line of a hundred or so people when a man volunteering for Amma came to us and to the two women wearing saris in front of us. He invited the four of us to be at the head of the darshan line. This was a major privilege as there would be thousands waiting to receive Amma’s hugs and blessings. We were so excited to be chosen. We were each given an orange circle sticker to wear to indicate we were first-timers to Amma’s darshan. Then waiting at the front of the line, we were invited to be among the only 12 in the Question line (when we could present a request to Amma) and the only 10 in line to receive a spiritual name from Amma personally. We entered the ballroom shoeless eager for this new experience. Unfortunately, the spiritual name plan was aborted, but i did get to ask my question in turn. We were coached to request in our questions not for healing, but for the higher Good. I asked for the higher Good for two of my friends suffering from breast cancer. Amma gave me ashes from a puja (sacred worship ceremony) to give to them. My friends were to rub the ashes on their chests before bedtime. At 10 a.m., the Sheraton’s ballroom was full to capacity. We knelt by Amma while hundreds of others were seated in many rows of chairs. Amma began with meditation. We were squushed together between blue lines taped to the ballroom floor sitting knee-to-knee. We were asked to sit erect and to breathe. We completed the meditation by chanting three AUMs. We were also asked to wipe down our faces with a tissue helpers provided. On knees, we moved up in line patiently waiting our turn for one of Amma’s famous hugs. When it was my turn, I was asked my native language. “English,” I said. My friend’s is Polish. Finally, I arrived to this Hindu saint. I was then coached to kneel in front of her, place my hands on the arms of the chair in which she was seated. With quick movement, she took my head to her chest, the side of my face pressed hard against her . She held me in a vice lock of a hug. She spoke softly and continuously into my ear in a language I could not understand. When she had completed what she told me, she released me, then held me back again holding me tighter, chanting quietly in English “my daughter, my daughter, my daughter” and gave me three kisses on my cheek. To my friend, she concluded with “mama, mama, mama. Then I was quickly helped to stand to leave the line making room for the next person. Amma did this for all those who knelt in line. It was a continuous river of bodies from 10 am until 4 p.m.–one after the other, no breaks. Even during the few moments she was being interviewed by a television journalist, Amma continued to hug and bless each person and family who came to her. Families were taken as a whole. The hug was amazing! I have never had one so intense. What I felt is still imprinted within. My only wish is that I could have understood what she spoke in my ear. I thought it might be a prayer, but one of the sari-wearing ladies we befriended understood the language and told me what Amma told her (and i paraphrase here)– “not to worry about your family issues, you have everything you need and everything will be all right.” It was more detailed than this, but with accents and the level of noise in the room, I missed some of the information. The previous year, I received darshan from Mother Meera in a church in Manhattan. It was entirely different–very controlled, orderly, silent and “don’t get too close.” We were instructed that children would receive the blessing through their parent, that they were not to be in line. Waiting for darshan there, I kept nodding off in my place in a pew in the midsection of the church. I could not stay awake. (Sometime later, a lady who works for a spiritual advisor I consulted, told me that often the conscious mind has to get out of the way for the work to take place. For Mother Meera’s darshan, I knelt in front of her. She placed her hands on my head and gazed directly and silently into my eyes. In the foyer of the church at her event, there were tables of photos, books and jewelry all with her image on them. All was silent and hushed. Amma’s event was a festival. There are vendors all around the room and more outside in the hallways. There was food, jewelry, beautiful saris with gold woven through ranging from $600 to more than $1600, other Indian clothing, photos of Amma, gifts she’s received, jyotish, radiant healing, herbs, incense, cds, dvds, books, chair massage, plants, essential oils– the list is long. Her volunteers sell these to raise money for her humanitarian activities, There is always the chaotic noise and activity of a fair-like atmosphere when Amma is in session, an experience truly joyful! NOTE: The original clipping that I received stands in a frame looking out over all our yoga classes. It is a presence and a reminder of my journey.